If ever there was such a thing as a touchy-feely techie, Ivan Poupyrev is. The 42-year-old son of a Russian mathematician, now senior research scientist at Disney Research, is leading us down a virtual reality (VR) path that could one day rival the experience of walking on a Star Trek Holo-Deck (y’all know I’m a Trekkie). 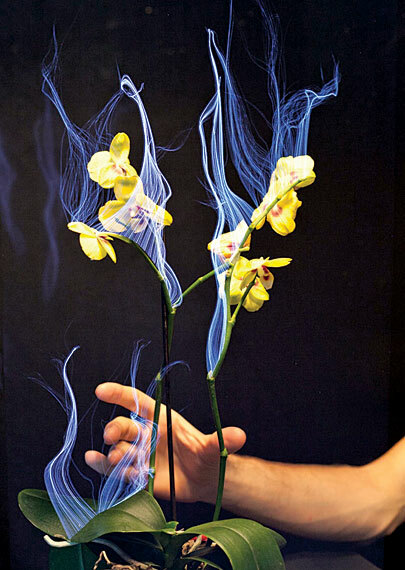 Poupyrev has already created an orchid that emits sounds when its stem is stroked… a knob that unlocks a door when it’s touched a certain way… with more good tech on the way (already 11 patents to his name). Having been at Disney since 2009, Poupyrev has also been working on technology that turns smooth surfaces into textures. Emitting a weak electrical signal through the body via a small device placed in the heel of a shoe or in a shirt pocket (see? like a Star Trek comm-badge… told ya! ), Poupyrev’s technology can make the wearer “feel” images he projects. For example, when the wearer touches an image of a ball projected onto a wall, it feels rubbery to that person. Similarly, a wearer can feel the ridges on a projected image of a mountain. “We can easily add tactile feedback to any wall and public spaces,” Poupyrev says.